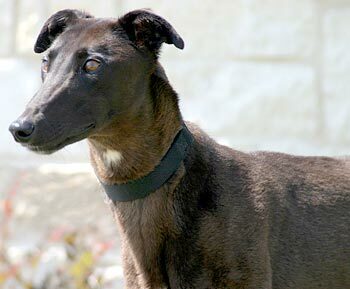 Rain is a petite, 1½-year-old black female greyhound. 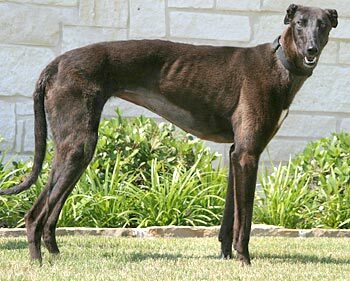 Rain, along with Lacy, was an owner surrenders from the Amarillo area. The owner, who could no longer afford to feed them, said the girls are sisters. Rain and Lacy were given away by the breeder to the previous owner because they were black. GALT made the decision to separate the two so that each girl could let her individual personality shine. Rain is the more outgoing of the two, often pushing her sister out of the way for the coveted attention. Rain will never know a stranger as she will willingly meet anyone that comes her way. If you're looking for the social butterfly, Rain is the girl for you. Rain's cat test: Rain is not cat tolerant and has not been tested with small animals at this time. Ms. 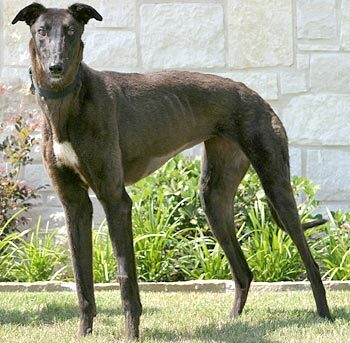 Rain is a petite, leggy, fluffy, energetic, chocolate espresso, loving and fun loving young girl. If there were a "next American Top model" contest for dogs, Rain would certainly be in the running. She has a wonderful gait which is often a prance, and with those long legs and petite body (she weighs in at a hefty 50 pounds), she is nothing short of adorable. We don't know much about Rain's past. She might have been living outside, which might account for her heavier coat (which she is slowly losing) and the brown on black color which she might lose if it is just that her coat had been bleached by the sun. For sure, Rain is beginning to thoroughly enjoy life inside a home. She enjoys her meals and now understands what snacks are and is very excited about good things to eat and to chew on. Rain is young, however, and is still learning house and adult manners. She does like to chew, which is a behavior we are working to correct. She will move anything she finds, from shirts to shoes to towels to toys. She loves toys and will frolic and bounce and thoroughly entertain her people pack. Rain walks several miles each morning and still comes home ready to run and frolic. 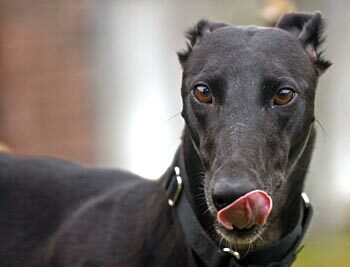 Even at her young age, she is the leader of the pack of three, including a 3-year-old and 7-1/2-year-old greyhounds. When they play and run, she leads, but is not accustomed to running in big circles or ovals. So, she often gets herself wedged in a corner of the yard with the other two waiting for her to start running again. Since she feels "cornered" she plays the puppy card and just lies down. Then they are up and running again. Being black, she gets hot more easily and loves (that's LOVES) to play in the kiddy wading pool. She splashes and jumps, again providing excellent entertainment. Once inside, she often finds a place under an air conditioning vent to lie down. She'll frequently lie on the bare floors rather than on a dog bed. At first she was crated at night; however, within a couple of weeks, she "graduated" to sleeping on a dog bed in our bedroom. For the most part, she stays in the same bed all night long. Rain is absolutely learning the ways of a household and has learned what it might mean when her people get dressed, or she hears keys jingle. 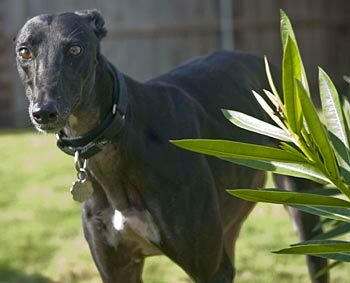 Rain is a loving girl who will always make sure she is closest to you to get scratches and rubs. If you stop rubbing, she'll lean in all the harder. She'll lay her head in your lap or on your shoulder for as long as you're willing to have her. She is also a smart girl and is starting to understand "stay, walk, wait and sit." It is great fun to watch her enjoy her life so much and to learn new things. This girl's youthful energy will keep you hopping, but will also have you laughing out loud and enjoying your life all the more.